Buffalo (CL99) was reclassified CV-29 and renamed Bataan 2 June 1942,reclassified CVL-29, 15 .July 1943 launched l August 1943 by New York ShipbuildingCorp Camden, N. J.; sponsored by Mrs. George D. Murray wife of' Rear AdmiralMurray; commissioned 17 November 1943, Captain V. H. Schaeffer in command,and reported to the Pacific Fleet. In her initial engagement with the Japanese, Bataan's planes supportedthe attack on Hollandia, New Guinea between 21 and 24 April 1944. Followingthis action were strikes against Truk, Satawan, and Ponape (29 April-1 May1944); Saipan, Marianas (11 June 10 August); 1st Bonins raid (1~16 June);Battle of the Philippine Sea (19-20 June); and the 2nd Bonins raid (24 June). Bataan then returned to the United States for repairs. Repairs completedshe Joined TF 58 and participated in the fleet raids in support of the Okinawaoperation (17 March 30 May 1945), during which her aircraft assisted inthe sinking of the Japanese submarine I~56 18 April 1945, in 26o42' N.,13o 38' E. Retiring to the Philippines, Bataan joined the 3rd Fleet for operations against the Japanese home islands (10 July-15 August). Bataan returned to the United States, arriving at New York 17 October1945, and was assigned to "Magic Carpet" duty. 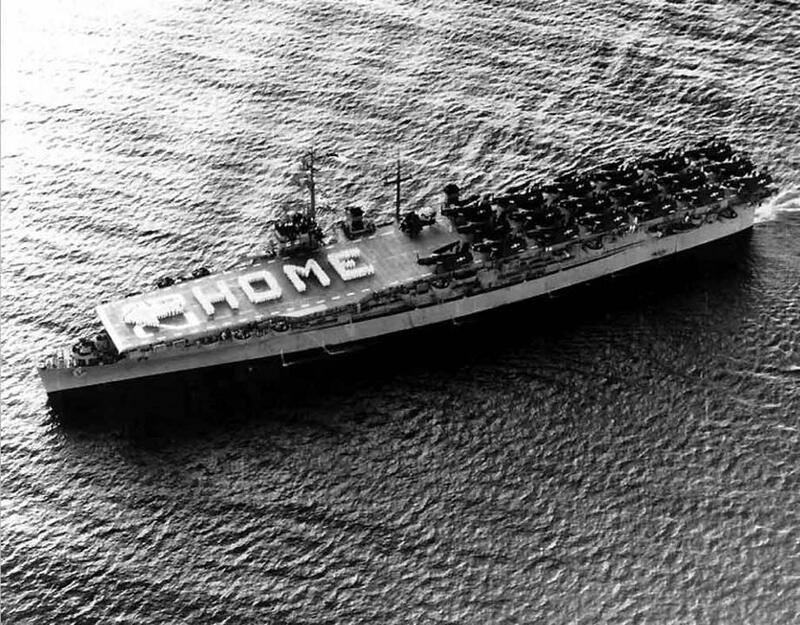 On 10 January 1946she arrived at Philadelphia to prepare for inactivation. Bataan went outof commission in reserve 11 February 1947. Bataan was recommissioned 13 May 1950 at Philadelphia. In July 1950 she stood out for San Diego, upon arrival loaded Air Force cargo and personnel,and departed 16 November for Tokyo Bay. She arrived in Korean waters 15 December and until June 1952 her aircraft flew strikes in support of theground forces. Bataan departed for the west coast 2 June 1951 and after a brief stopat San Diego steamed ~to Bremerton Wash., 9 July for overhaul. She returnedto San Diego 20 November and on 27 January 1952 departed for Yokosuka Japan,and thence to Buckner Bay, Okinawa. She conducted air exercises and othertraining maneuvers off Okinawa until 29 April when she sailed for Koreanwaters. Bataan continued operating between Japan and Korea throughout thesummer of' 1952 carrying personnel and supplies to the fighting area andlaunching strikes against the enemy. She left the fighting zone 11 Augustfor San Diego. On 27 October the carrier once again stood out for the Far East and operated off Korea until 10 May 1963 when she departed for SanDiego. She remained in the San Diego area undergoing overhaul and training until31 July. Then she sailed via Pearl Harbor to Kobe and Yokosuka, Japan, andthen back to the United States where she reported for inactivation 26 Augustl953. She went out of commission in reserve 9 April 1954 at San Francisco. Bataan received five battle stars for her World War II service and seven for her Korean Service.